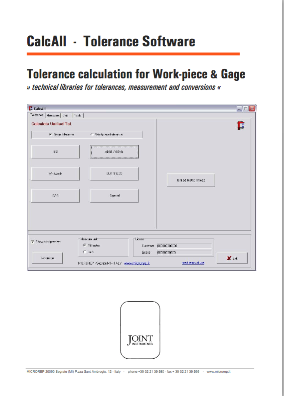 Automatic tolerance calculation for hard gages such as plain plug, thread plug, plain ring and thread ring. Plain and thread part tolerance. Formulae to calculate thread diameter from the reading "over wire". Effective diameter tolerance, drilling hole size, external and internal diameter of the gage. ISO metric gages and workpieces - according to ISO/R - 1938, ISO 286, ISO 965/1, ISO/R – 1502. ANSI/ASME gages and workpieces - according to ANSI/ASME B1.13M (ISO 965/1), ANSI/ASME B1.16M 1984, Plain gage ANSI-inch, ANSI/ASME B89.1.6M-1984, Gagemaker's Tolerance Chart, ANSI/ASME B.1.1-1982, ANSI/ASME B1.2-1983, ANSI/ASME B.1.20.1-1983, ASME B1.20.5-1991. Whitworth gages and workpieces - according to BS 919, BS 84. 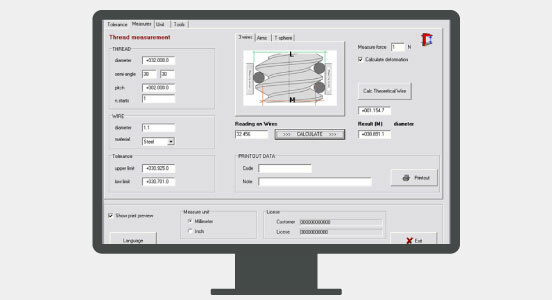 Buttress gages and workpieces - according to ANSI B1.9, BS 1657. Gas gages - according to ISO 7, ISO 228.